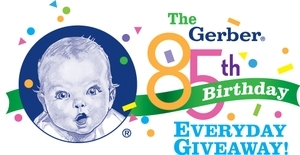 Home > Gerber Newsroom > Press Releases Happy 85th Birthday Gerber! Let’s Celebrate! Happy 85th Birthday Gerber! Let’s Celebrate! (FLORHAM PARK, NJ) – April 10, 2013 – This year, the iconic Gerber brand celebrates 85 years of helping parents raise happy, healthy babies. Gerber was created by Dorothy and Dan Gerber – two parents who sought a better, more convenient way to nourish their children. Since then, generations have benefited from Gerber’s commitment to nourishing babies. Parents can feel proud that they are laying the foundation for their baby’s healthy growth and development with foods designed to help meet the nutritional and developmental needs of babies and children through 4 years of age. To celebrate the occasion, Gerber is helping birthday wishes come true for loyal fans by giving away thousands of dollars in cash prizes! For 85 days, Gerber will award one $585 daily cash prize. At the end of the 85 days, Gerber will make one lucky winner’s birthday wish come true with a $20,085 Grand Prize! For a chance to win, people can “Like” the Gerber Facebook page and enter the birthday sweepstakes once daily through June 30. 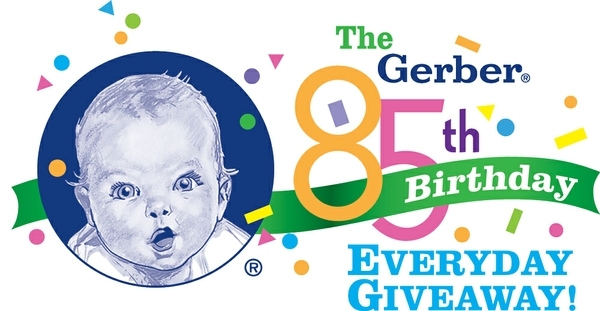 Fans may also receive up to five additional grand prize entries when they share the Gerber 85th Birthday Everyday Giveaway with friends who then enter. To enter for a chance to win and learn more about how Gerber has been pleasing millions of parents and babies for the past 85 years fans can visit the Gerber Facebook page! Through the years, Gerber has continuously innovated and evolved to meet the needs of babies and toddlers as well as parents. Beginning with the first cans of Gerber baby foods in 1928, to the introduction of Gerber cereal (1939) and, more recently, foods designed especially for toddlers (1990), Gerber has demonstrated its commitment to providing products that help meet the nutritional and developmental needs of babies and toddlers. Ensuring the quality and safety of all products has also been a priority at Gerber, which has led to labeling and packaging innovations like the “better if used before” date and safety button cap, tamper-evident packaging (1963). Gerber is committed to rigorous internal quality standards and processes to ensure the safety of all of its products. With the Start Healthy, Stay Healthy™ Nutrition System, Gerber provides parents with 24/7 nutritional support, guidance and education as their child grows. There are six color-coded Start Healthy, Stay Healthy™ Milestone Symbols™, each of which is associated with specific cues that reflect a child's stage of development. One of these Milestone Symbols™ appears on all Gerber products to make it easy for moms to quickly identify the products that are appropriate to introduce to their child at each developmental stage. Gerber Products Company joined the Nestlé family on September 1, 2007. Gerber Products Company is committed to being a leader in early childhood nutrition. All trademarks are owned by Société des Produits Nestlé S.A., Vevey, Switzerland. The Start Healthy, Stay Healthy Milestone Symbols are trademarks of Societé des Produits Nestlé S.A., Vevey, Switzerland. Unless otherwise indicated, all trademarks are owned by Societe des Produits Nestlé S.A. or used with permission. © 2015 Nestlé. All rights reserved. If you do not live in the U.S., please read this special notice. The content of this site is intended for U.S. residents only.